and understand how a remodeler's business should work. One article suggesting how to price a job actually said that if you need a 30 percent margin, you should mark up by 30 percent. FYI, margin and markup are two di•erent things! Although they may be publishing false information simply due to their ig- norance, and not to intentionally mislead, they are still publishing or re-publishing information that could hurt innocent busi- ness owners. Just as I do, I ask you to point out these discrepan- cies when you nd them. I think as professionals we owe it to ourselves, as well as our industry, to collective- ly protect the information shared with those who will eventually replace us. €e media makes money because we view what they publish. Our industry's business owners should be able to count on the integrity of the information published by the magazines. I believe it is the media's responsibility to vet the information they publish and promote. If they can't or won't do so, perhaps they need to add that quali er to their websites and to everything they publish. If you agree with me, send your thoughts to the editors of our industry's magazines. If you disagree, I hope you will respectfully articulate your point of view as well. | DON'T CONDONE BUSINESSES THAT HIRE ILLEGAL IMMIGRANTS Lady Justice is blindfolded for a reason. €e fact is, illegal is illegal, and there is not supposed to be a sliding scale in our justice system. Businesses that hire illegal workers are not innocent bystanders, they are oper- ating illegally on purpose by hiring illegal immigrants. €ey are also, therefore, taking an illegal advantage over law-abiding busi- nesses and hard-working remodelers. €ey are also potentially taking jobs and income away from Americans and legal immigrants. Some media outlets in our industry publish infor- mation in favor of tolerat- ing illegal activity, which should make us all cringe. Businesses operating illegal- ly should be held account- able for their actions, not assisted by the media's po- litical opinions expressed as if they are facts. And please stop calling them immigrants, which is false information and unfair to legal immigrants. €ey are illegal immigrants. I suggest there is another reason why this is important. Until—and unless—we con- sciously and purposely di•erentiate between legal and illegal immigrants, politicians and our industry will not be able to amicably con- centrate on nding an acceptable way to help illegal immigrants become legal and, at the same time, ll the job positions that remod- elers will only become more desperate to ll as the economy and remodeling marketplace keep cranking up. STOP PUBLISHING INACCURATE BUSINESS ARTICLES Since the recession I have observed there are way too many industry media sta• who lack the experience and schema to know n an e•ort to help promote and maintain professionalism in the remodeling industry, I am tossing out three challenges to the media serving the remodeling industry. I haven't seen where anyone else is doing this, so I'm taking the risk of stepping up to the plate for our industry. €ese challenges are, of course, based on my opinions. You may agree with me, or you may see things di•erently. Either way, I hope you will express your opinion regarding my challenges. To help maintain professionalism, if you choose to share your thoughts I ask you do so in a respectful and thoughtful way. STOP GIVING PROJECT AWARDS TO REMODELERS WHO DON'T EARN A PROFIT ON THOSE PROJECTS €is one has bugged me for a long time. Should we, as an industry, honor contrac- tors for their good-looking work if they don't know how to charge for and produce their projects at a pro t? Honoring a business for a project they lost money on is not fair to those professionals who consider making a pro t a condition of being in business and o•ering services. To help make this happen, why not require an accountant-validated estimate and job cost report for all projects submitted? €at way, the judges can also make sure the applicant is estimating and job-costing apples-to-apples, something I already know the majority of our industry just can't do in regards to eld employee labor. If the magazines disagree with me, perhaps a good compromise might be that they clear- ly state when they publish and promote the winners that making a pro t was not a re- quirement. 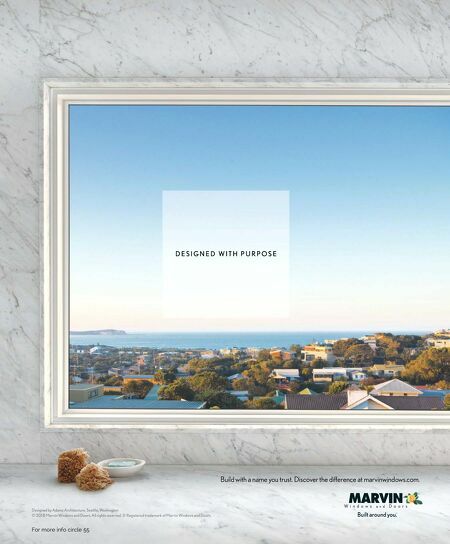 €at way, homeowners and other remodelers reviewing the awards can decide for themselves the validity of the awards and the award program itself. 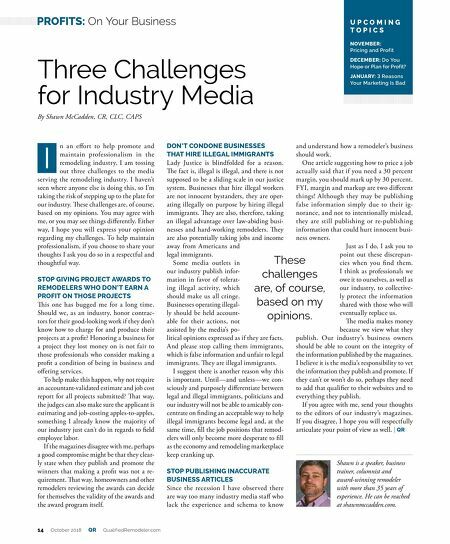 Three Challenges for Industry Media By Shawn McCadden, CR, CLC, CAPS U P C O M I N G T O P I C S NOVEMBER: Pricing and Profit DECEMBER: Do You Hope or Plan for Profit? JANUARY:Ƒå±ŸŅĺŸ ¥Ņƚųa±ųĩåƋĜĺčFŸ±Ú These challenges are, of course, based on my opinions. I 14 October 2018 QR QualifiedRemodeler.com PROFITS: On Your Business Shawn is a speaker, business trainer, columnist and award-winning remodeler with more than 35 years of experience. He can be reached at shawnmccadden.com.